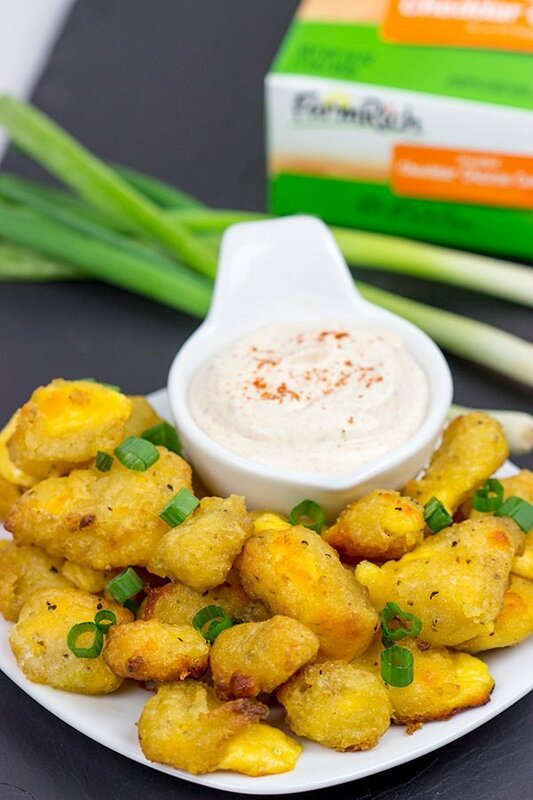 These Bacon and Cheddar Cheese Curd Bites make for a delicious appetizer…especially while watching sports! And the smoky ranch dressing? It’s tasty enough to be a dip all by itself! As I’ve mentioned before, I’m a huge college basketball fan. Like gigantic college basketball fan. I’ve watched college basketball for pretty much as long as I can remember. In college, I went to as many games as I could. After college, I would schedule my evenings around my favorite team’s games. And I still do. Well, sorta. Curling has made it a bit difficult to catch all of the games as my curling games always seem to fall on the same night that my team is playing. Every single time. How does that keep happening?? I do peek at my phone to keep up with the score, but it’s just not the same as watching live. But come March and the college basketball tourney? Everything changes! My first job out of college was at a local bank in Durham, North Carolina. I’m not kidding one bit when I say that we set up big screen tv’s in the bank lobby so that customers (and us employees, too) could keep up with the tournament games. After moving away, I began taking vacation days during the tournament just so I wouldn’t miss any of the action. Seriously. The first Thursday and Friday of the college basketball tourney? I’m on vacation. I’m at home getting ready to watch 12 straight hours of games…only to turn around and do it again the next day! The odds of filling out a perfect bracket? Pretty much non-existent. 1 in 9.2 quintillion. You’d be better off buying a lottery ticket! A #16 seed has never beaten a #1 seed. They’ve come close on a couple of occasions, but it’s never happened. A #5 seed has never won the whole tournament. Amazing, right? But it’s true! Since 1979, at least one #1 seed has reached the Final Four every year except for 3 years. Chances are pretty good that a #1 seed will be there! All 4 #1 seeds have advanced to the Final Four only one time (2008). Pizza orders increase 19% during the month of March. I say let’s put the pizza on hold and make a batch of these Bacon and Cheddar Cheese Curd Bites! Bacon and cheese. Talk about the perfect flavor combo for a delicious appetizer! Have you ever had cheese curds? I’d never had ’em until we moved up here to upstate New York about 7 years ago. Cheese curds (aka “squeaky cheese”) are hugely popular as part of poutine. Poutine is a regional Canadian dish consisting of french fries topped with cheese curds and gravy. It’s amazing! One bite, and I was hooked. 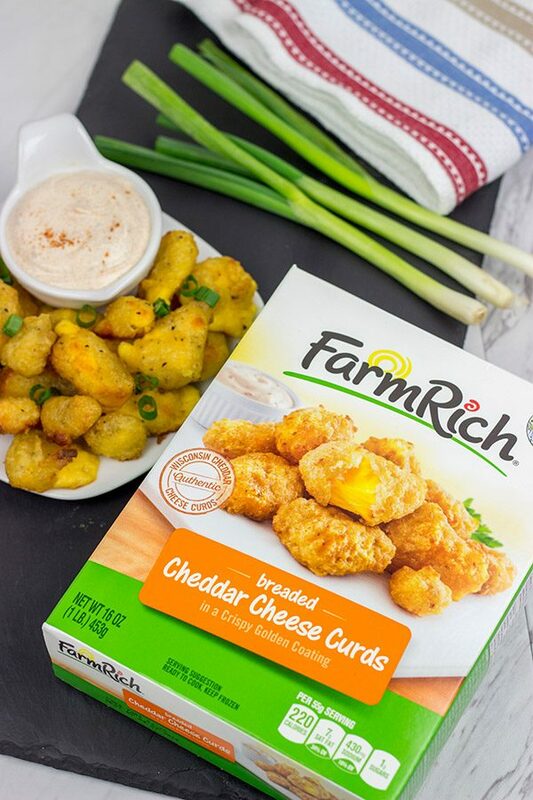 While Farm Rich’s Cheddar Cheese Curds are delicious by themselves, Laura and I enjoy creating fun appetizers with curds. 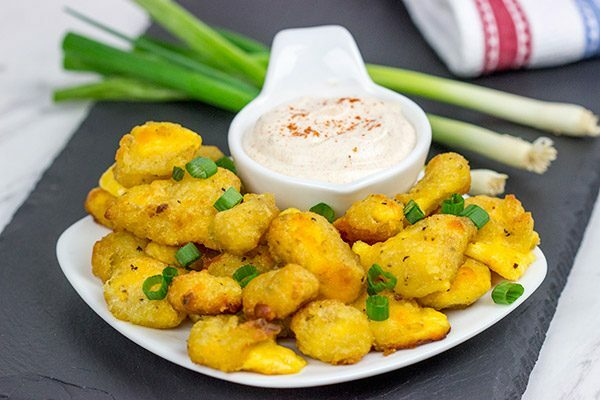 Take these Bacon and Cheddar Cheese Curds Bites for instance. 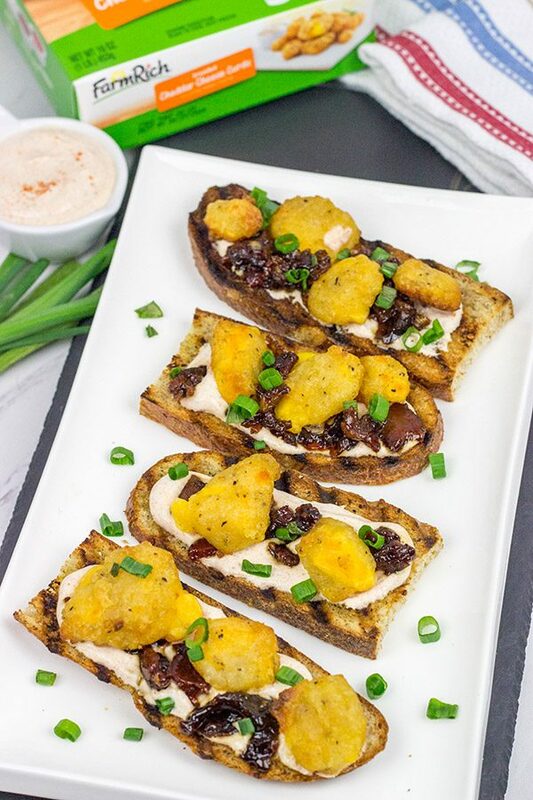 Crispy pieces of toast topped with a smoky ranch dressing, bacon and Farm Rich’s Cheddar Cheese Curds. Now this is the kind of appetizer that’s perfect for watching college basketball! In fact, if you’re looking for me anytime during the next couple of weeks, check the couch…chances are I’m watching the tournament with a plate of these Bacon and Cheddar Cheese Curd Bites. Oh, and for the record, this Smoky Ranch Dressing is tasty enough to serve as a dip all by itself! I whisked this up in about 60 seconds, and then Laura and I both dipped in a cheese curd to try it out. Woah! Mind blown. 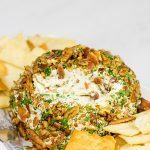 Farm Rich makes a whole assortment of snacks and appetizers, and I’m thinking their Mozzarella Sticks dipped into this smoky ranch dressing will be a winner. Or the Jalapeno Peppers. Or the Boneless Buffalo Chicken Bites. I mean ranch and buffalo sauce were just made for one another, right? Maybe that trio will be my snack while watching tomorrow’s games! Farm Rich’s products are wholesome, feel-good foods that are perfect for when you need great-tasting food in minutes! Click here to find Farm Rich products near you. Good luck with your brackets and may the best team win! Cheers, friends! Using a medium bowl, combine all ingredients (sour cream, ranch seasoning, smoked paprika) until well blended; set aside. Slice the loaf of French bread widthwise into 3 large pieces; slice each piece lengthwise into thin slices. 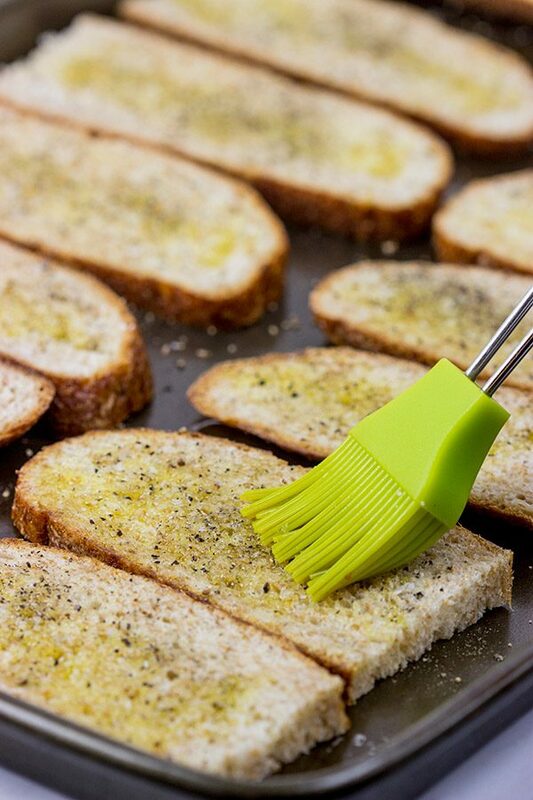 Brush the tops of slices with olive oil and then sprinkle salt and pepper on top. Place slices in grill pan for 4-5 minutes, or until grill marks appear. Remove toasts from pan and set aside. While the toasts are baking, cook the bacon in a large skillet until crispy. Remove bacon to a paper-towel lined plate. Drain and discard bacon fat, leaving 1 Tbsp of bacon fat in pan. Reduce heat to medium-low. Add onions and cook for 10-12 minutes, stirring occasionally, or until onions have softened. Add remaining ingredients (garlic, brown sugar, vinegar, maple syrup and chili powder); stir and bring mixture to a simmer over medium heat. Once simmering, add crumbled bacon, stir and reduce heat to low. Cook for 8-10 minutes, stirring occasionally, or until mixture has thickened. While bacon jam is simmering, bake the cheese curds according to package instructions. Assemble bites by spreading smoky ranch dressing on each toast. Then top with a spoonful of bacon, several cheese curds and green onions. Serve hot. If you don’t have a grill pan handy, these toasts can be baked in a 350°F oven for 20 minutes, flipping half-way through. 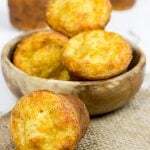 Disclosure: This Bacon and Cheddar Cheese Curd Bites post was sponsored by Farm Rich, but the recipe and opinions are entirely my own. Thank you for supporting the brands that support Spiced! This is freakin’ genius, David!! What a flavour packed bite. I would be SO tempted just to gobble all those curds on their own! I’m not a big sports watching person, but am definitely down for the food. I have got to keep my eyes open for these next time I’m in the grocery!! One in 9.2 quintillion you say? That’s pretty cool considering I know my brackets are perfect this year. It’s always easier when Oregon isn’t in the tournament because I usually have them winning everything, which means I lose the office pool big time. As for these cheese curd bites, I don’t think I’ve ever heard of anything more delicious than a breaded cheese curd. I’m looking for these at the store today! Happy March Madness! Your brackets are perfect this year?? Then you better go enter all of those bracket challenges ASAP, Kelsie. I just heard that Warren Buffett is offering a million dollars a year for life if you fill out the perfect bracket! Considering the odds, though, I think that’s a safe offer he made. Anyways, breaded cheese curds. They’re delicious! Oh, and speaking of basketball, I saw that Oregon won their first-round game in the NIT. That’s a good excuse to go grab some cheese curds and curl up on the couch for their 2nd round game! 🙂 Thanks, Kelsie! Oh man, I’ve never had cheese curds in Wisconsin. I’ve actually never been to Wisconsin. Oh wait, check that. I did make a trip there with the Georgia Tech basketball team for the NCAA tournament…but I won’t say how many years ago that was. It’s been a while! And sadly no cheese curds were involved in that trip. Definitely take a look for these curds next time you’re in the store, Mary. 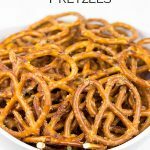 They’re a fun weekend snack! When I saw the name of this post, I immediately thought of poutine (I’m a huge fan of it too. Surprisingly how a few basic ingredients when combined together, make something amazing). These curd bites look good too, I need to check this brand. But you’ve managed to elevate them to a new level served with bacon ham (mmm!) Well done, David! Yes! I love a good poutine, too, and I’ve been thinking about trying my hand at a homemade version. I just haven’t gotten around to it yet. Soon! But in the meantime, these curd + bacon bites are a mighty fine stand-in. And you’re right, Ben…bacon makes everything better! 🙂 Hope your week is going well, my friend! Amazing that you were able to follow the games while working in a bank – how nice of them to put TVs up for their customers and employees. I love little tasty bites and what an irresistible combination of bacon and cheddar cheese! Have a lovely weekend, my friend! I know! So the mid-Atlantic states are basketball crazy here in the US, and I loved working at that bank during the tournament. It was crazy having a big tv right there in the lobby, and fans from all teams would stop by for a few minutes and watch. Kinda cool! Thanks so much, Miriam! Well what do you know, my first job out of college was in a bank too. But we wouldn’t have got away with putting up a TV to watch any sports in the bank lobby. I do however remember we watched much of a World Cup Tournament in the back office on a portable colour TV. We had to take turns holding the aerial up (yes it was that long ago) so as to get a decent picture! Ha ha! OK, no I’ve never had cheese curds. But I like the sound of Poutine! 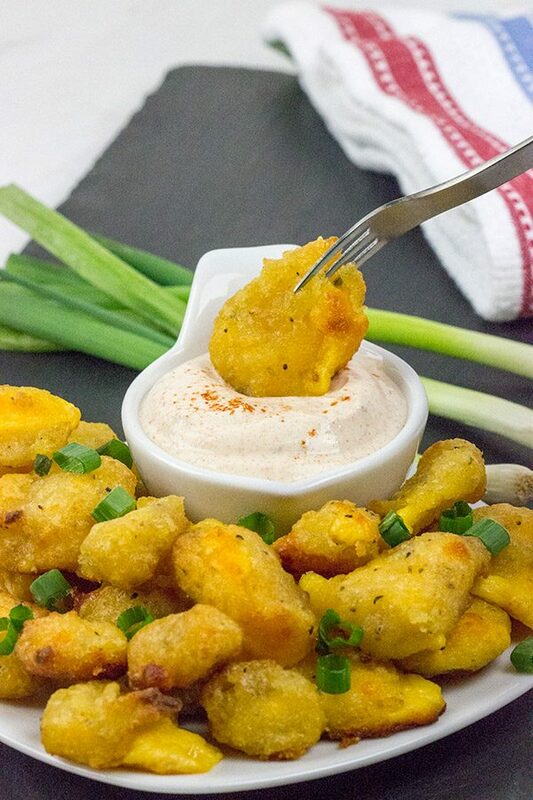 And oh, that smoky ranch dressing sounds amazing with these tasty cheddar cheese curds. Yum! Hah! Maybe there’s something about working at a bank out of college that sets you on the path to becoming a food blogger? 🙂 So the mid-Atlantic region here in the States is basketball country, and I think the bank set up tv’s just to encourage customers to keep doing business rather than just stay home to watch the games. It’s that serious! Actually, it’s pretty much on par with the World Cup in other countries. (Now we just need to get the World Cup to be as popular here in the US…of course, we need a US team that actually qualifies. Ugh!) If you ever get the chance to try these cheese curds (or poutine), then definitely do it! Thanks so much, Neil! Have fun at the anniversary party this weekend! I’ve never thought of using cheese curds like this. Super creative, David! Looks absolutely delicious! I’d never even heard of cheese curds before we moved up north, but now they are a staple appetizer! They’re tasty on their own, but it sure was fun whipping up these bites with the smoky ranch sauce and bacon jam. 🙂 Thanks, Marissa!! That’s such a fancy and flavorful appetizer idea! Not just for game nights but also for get togethers and celebrations! I don’t think I can find these cheese curds in India..but I will be on the lookout..I could just eat them on their own ..but a little extra effort to make these is gonna be great too! Haha! We do enjoy coming up with fun appetizers while watching sports. Be it football in the fall/early winter or basketball in the late winter, there’s always some sport on tv in our house! And when there’s sports on tv, there’s got to be tasty appetizers on the table. 🙂 Thanks so much, Kathy! Happy March Madness, David! I love all of the statistics, and am happy to see that a #16 beat a #1! (Hope Virginia wasn’t your team!). I love this time of year, too, and hoping my team stays in it all the way – fingers crossed! I love anything with cheese curds, fried, or poutined! Thanks for this genius recipe! Happy March Madness right back at ya, Laura! Virginia was definitely not my team, and I can’t believe that happened. They’ll still be talking about that game 30 years from now! My team is still dancing as well, and I’m hoping for a deep run this year! 🙂 Of course, all basketball games need delicious appetizers, and these cheese curds are a new favorite around here. Thanks, Laura! 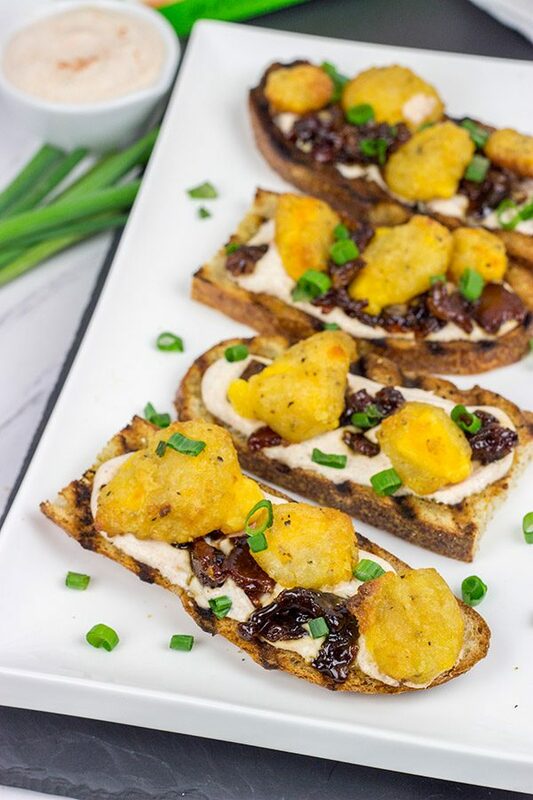 I thought I had tried ALL the Farm rich products but I haven’t tried their breaded cheese curds yet – these look so good – ESPECIALLY with that bacon jam! Ahhhh! 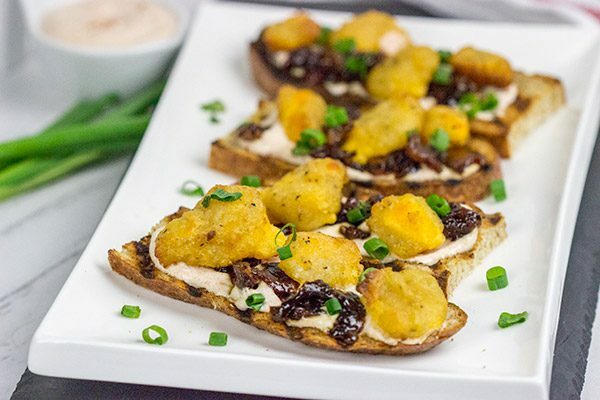 I could do some serious damage to a tray of those bites and that bacon jam – they might not even make it onto the elegant toast with that delectable smoky ranch dressing! I gotta confess – am not about watching much sports (other than soccer – aka the real football) on tv – I’m at game day get togethers ONLY for the food and company – and I’d be early to any party that served these as appetizers! YUM!